The Cura II and Cura II Supreme Community Beds are fantastic bed solutions for patients, providing both back and knee profiling for improved comfort and better positioning. 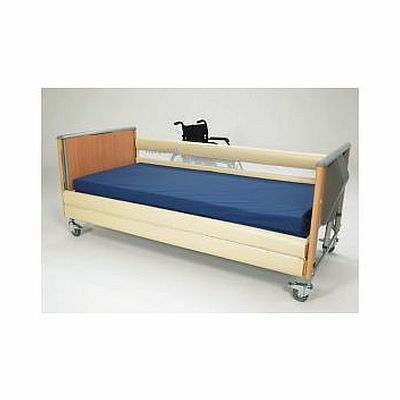 The optional Cura II Community Bed Full Length Side Rails help to provide additional safety, but can introduce a risk of patient entrapment or injury resulting from contact with the rails. The Cura II Community Bed Side Rail Netted Bumpers are a set of soft foam bumpers with tough netting that fit the Cura II Side Rails, providing safety and peace of mind for patient and carer alike. Thanks to the soft foam, the bumpers provide additional safety to patients who require side rails, for example those using a mattress and overlay combination. The soft foam helps reduce the risk of accidents or injuries as a result of the side rails. The included netting helps to prevent limbs from leaving the bed and potentially getting trapped in the rails. To help you set up the bed to best match the patient's needs as quickly as possible, the bumpers have been developed to be easy to fit to the rails. To help ensure that total protection is provided, the bumpers are supplied in pairs. A wipe-clean polyester cover makes it easy to maintain hygiene and perform effective infection control. Additionally, the netting will concertina down when the bed rails are lowered, helping you save space and time when lowering the rails. Please note: This listing is for the bumpers only, and does not include a Cura II bed or side rails. Additionally, this product is not compatible with the Cura II Community Bed Four Bar Side Rails.